In a large mixing bowl, beat together the butter, sugar, vanilla, and salt until smooth. Beat in the egg. Whisk the flour with the cocoa, baking powder, and baking soda in a small bowl. Add the flour mixture and yogurt to the bowl and combine until smooth. The batter will seem dry but don’t worry because the water from the zucchini will moisten it. Fold in the zucchini and 1/2 cup chocolate chips until well incorporated. Divide the batter evenly into the prepared muffin pan. Bake for 25 minutes or until a tester inserted into the center of a cupcake comes out with a few moist crumbs or the tops of the cupcakes spring back when touched lightly with your finger. Let cool about 10 minutes, then remove from the pan to a rack and cool completely. Make the ganache: add the cream and chocolate to a small saucepan and place over the lowest heat setting on the stove. Heat gently but don’t let it come to a boil. Stir to incorporate the chocolate with the cream completely. Remove from heat. 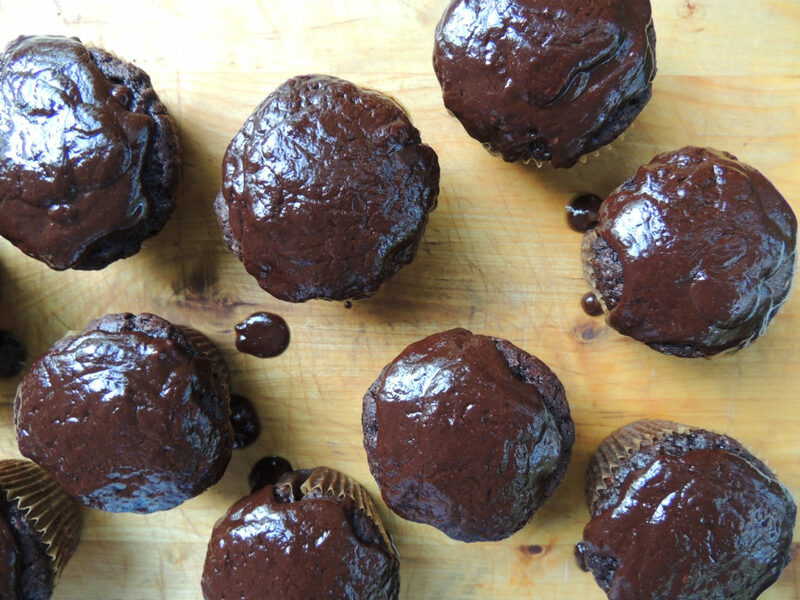 Drizzle or spoon the ganache onto the tops of the cupcakes. Let the ganache harden up a bit before serving.